Do I need a massage education? Can I have a massage after the seminar? Who normally participates in the seminars? No, no experience is necessary. Our massage seminar is aimed at anyone who wants to learn mobile massage on the massage chair to then offer this professional to your customers. Budding Wellness masseurs who play with the idea to make a living in the massage area, or a trained state masseurs who want to jump on the mobile massage trend are invited. Also no, but almost. Well taught knowledge and good practical explanation does not make a good massage therapist. This requires some practice. However, after the Semniar you have the best conditions to advance with a little motivation and diligence to a luminary in the mobile massage. This is quite different. Our spa therapists however, are most like come to us between 25 and 45 years old, motivated, friendly and reliable. These are among other key criteria for successful masseurs or masseuses – at least for us. 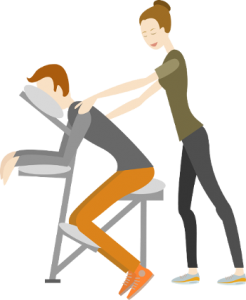 You have the option to start with neckattack as a freelancer or franchisees (successfully completed their training course) after the massage seminar. We, as a company neckattack be, then you are trying to convey customer orders, or to assist you as a franchisee with flyers, business cards, a professional web presence and a marketing strategy, as well as a sales strategy. practice / theory / anatomy: shoulder girdle, spine, iliac crest, deep muscle / superficial back muscles, Deltoidus, rotator cuff, etc. practice massage techniques: Selective techniques, scale techniques, pressure adjustment, freedom from pain. The second day is fully under the sign of the exercise: We practice what we have learned on the first day, so that participants can apply what they have learned immediately. Find neckattack© Massage Seminars every 2 months at our offices in Stuttgart. *The number of participants is limited to 12.